Frederick James Turner was born in Yeovil in 1890, the youngest child of farm labourer George Turner (b1851) and Emma née Rowe (1855-1941). George and Emma were to have seven children: Bessie Georgina (1876-1957), Sarah Anne (b1878), William George (b1880), Albert John (b1882), Walter Charles (b1885), Tom Henry (b1887) and Frederick. By 1891 the family had moved to East Knoyle, Wiltshire and by 1901 they had moved again to West Stour, Dorset, where George worked as a cattleman on a farm. Frederick enlisted at Bournemouth, giving his address as Moordown, Hampshire. He joined the 2nd Battalion, Hampshire Regiment. His Service Number 8247 indicates that he enlisted in October 1908. At this time his battalion were in South Africa and he presumably joined them there after his basic training in England. The Battalion remained in South Africa until 1911 when they moved to Mauritius. The Mauritius posting lasted two years and the Battalion was next shipped to India. The 2nd Battalion The Hampshire Regiment had only eight months in India when war broke out. On 31 August 1914 it was directed to leave Mhow at once for Bombay to take over from the Sherwood Foresters. The Battalion stayed at Colaba (where they removed ammo from a ship on fire in the dockyard) until the middle of November, when the 1/7th Hampshire relieved them. In all 21 officers, 43 sergeants, 15 drummers, and 816 rank and file boarded the Gloucester Castle on 16 November and headed for England. On 22 December 1914 the convoy reached Plymouth, then Romsey. They joined the 29th Division and were attached to the 88th Brigade at Stafford-on-Avon and Warwick. In early 1915 the battalion became part of the 88th Brigade, assigned to the 29th Division. The 2nd Hampshire were supplied with 2 drafts of men, 181 on 31 January 1915, and 50 on 20 February. It was at first allotted for France, but then was dispatched to Gallipoli, and embarked on 28 March 1915. Before they left on 20 March 1915 the whole division passed in review of the King. W and X companies embarked on the H.T. Aragon, Y and Z in the Manitou, 26 officers, 993 other ranks. Calling in Malta on 2 April 1915. Frederick was taken ill while in Gallipoli and was transported to a military hospital in Malta. He died from pneumonia in Malta on 5 November 1915. He was aged 25. 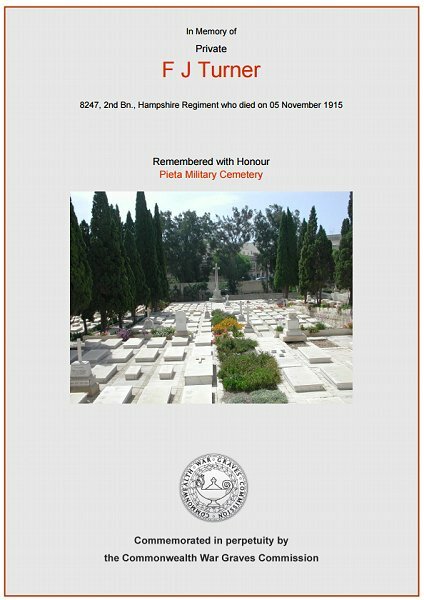 Frederick Turner was buried in the Pieta Military Cemetery, Malta, Grave D.III.3. His name was added to the War Memorial in the Borough in 2018. The Commonwealth War Graves Commission certificate in memory of Frederick Turner. 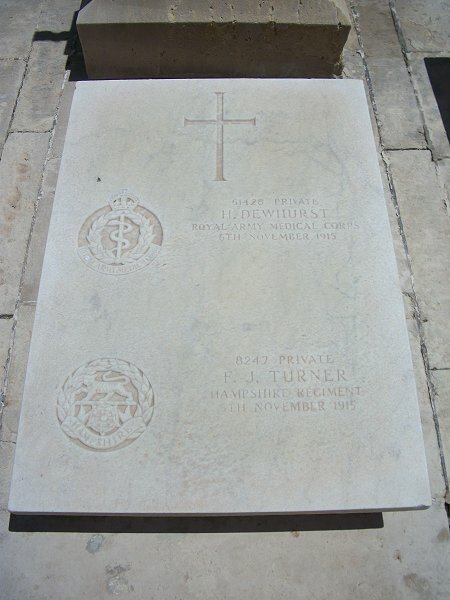 Frederick Turner's grave in the Pieta Military Cemetery, Malta.